Cecilia Fox | Weekly Record Herald Superintendent Ginny Potter honored the members of the school board as part of School Board Recognition Month, which is celebrated in January. BETHEL TWP. 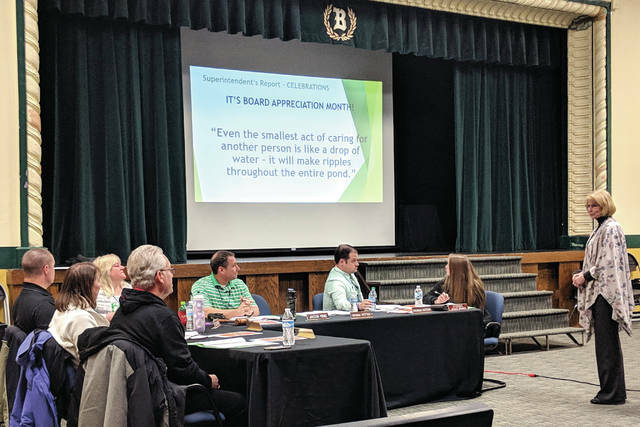 — At the first meeting of the new year, Bethel Superintendent Ginny Potter provided an update on transportation and enrollment. She also thanked the board for their service as part of School Board Recognition Month. Potter updated the board on the district’s transportation department, which is still looking to hire new drivers. She said that there are currently four double routes for the elementary, which will continue through the rest of the year. “There’s no way around that right now,” Potter said. High School Principal Barrett Swope and Transportation Director Gayle Rhoades are filling in as substitute drivers as needed. Potter added that Rhoades is training some substitute bus drivers. The district is facing some possible bus purchases, Potter said. Two buses, 1998 models, have reached more than 330,000 miles and need to be replaced. A 1998 model handicap bus could also be replaced with a used bus. Potter also noted that the district’s enrollment has gone up slightly since the beginning of the school year and is now at 1,557. In September 2018, the total enrollment was 1,543. “We did lose some last month, but we gained back 10,” she said. She added that the district will need two to three new elementary school teachers next school year, as well as another English as a second language (ESL) teacher, a special education teacher, a middle school teacher, part time math teacher, and an assistant middle school and high school principal. She also touched on some maintenance, including the installation of a security gate near the cafeteria meant to keep cafeteria traffic away from a nearby classroom. Warranty work has been performed on some leaks in the new high school, she added. Bleachers in both gyms were inspected by a third party for safety. https://www.weeklyrecordherald.com/wp-content/uploads/sites/51/2019/01/web1_IMG_20190114_191118.jpgCecilia Fox | Weekly Record Herald Superintendent Ginny Potter honored the members of the school board as part of School Board Recognition Month, which is celebrated in January.